Find adventure getaways in PA that will blow you away! Enjoy the finest outdoor adventure getaways in Pennsylvania. Whitewater Rafting, Biking, Kayaking, Rock Climbing, and More! Located in the heart of Laurel Highlands in Southwest PA, Wilderness Voyageurs offers a diverse variety of outdoor adventures that will delight thrill-seeking travelers everywhere. Activities include whitewater rafting, mountain biking, kayaking, rock climbing, and fly fishing. Spend two nights camping at the Voyageurs' Ohiopyle base. Camping equipment and meals will be provided. Choose from a series of cool packages, including the Surf & Turf Package, which allows you to enjoy a day of biking and whitewater rafting. Do not pass up one of the most fun adventure weekend getaways in Pennsylvania! Choose from a Huge Variety of Outdoor Adventures! Nestled in the heart of the Pocono Mountains in Northeastern PA is the Skytop Lodge, one of the great outdoor adventure getaways in Pennsylvania. 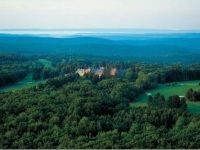 The beautiful resort is only two hours from New York City and Philadelphia, making it easily accessible for travelers. The abundance of activities and outdoor adventures includes hiking, skiing, dog sledding, ice skating, snowshoeing, fishing, tennis, shooting, tree top adventures, paintball, mountain biking, kayaking, canoeing, rock climbing, and golf. Stay at the Main Lodge, in one of the deluxe cottages, or enjoy lodging right on the golf course! Enjoy a Memorable Adventure Getaway in Pennsylvania! For a true adventure getaway in PA, get The Jim Thorpe Experience! Enjoy biking, hiking, kayaking, historic tours, and more. Get the most out of your visit to the amazing town of Jim Thorpe, with experienced guides who will educate you about the area's unique history and lead you on one of many awesome outdoor adventures. In the winter, The Jim Thorpe Experience offers snowshoeing tours. Check the website for a list of affordable combo packages and 2-day adventures that will satisfy all outdoor enthusiasts. A Thrilling Adventure for Cycling Enthusiasts Everywhere! Are you a cycling enthusiast? 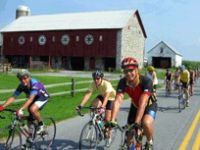 Then, Scamp 'N Rascal Cycling Adventures will prove to be one of the best adventure getaways in PA. With a multitude of quiet country lanes throughout Pennsylvania, you'll be treated to some of the greatest road cycling in the U.S.! Scamp 'N Rascal's Amish country tours will transport you to places commonly unseen by tourists in the area. Step back in time, as you watch Amish farmers work in their fields with horse-drawn equipment. 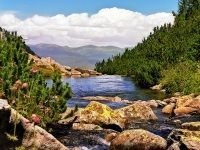 Or embark upon the Down River Ramble Tour, which follows the rivers and stream through valleys carved by glaciers. One of the Top Adventure Getaways in PA! If weekend adventure getaways in Pennsylvania are what you seek, why not take advantage of world-class whitewater rafting? Raft along the East Coast's best whitewater rivers. 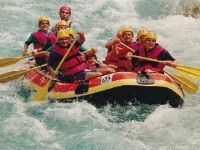 Whether you're a first-timer looking for a gentler rafting trip or an adrenaline junkie who craves exhilarating rapids, you will find the adventure of your choice. Whitewater Challengers also offers mountain biking, whitewater kayaking, hiking, Ziplining, and paintball. Feel free to stay at one of several excellent B&B's, motels, hotels, and campgrounds in the nearby area. 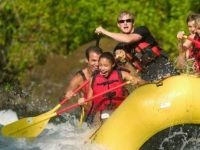 Some of the Most Exciting Whitewater Rafting in PA! 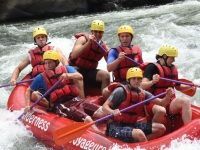 A premier outfitter on the Lehigh River, Whitewater Rafting Adventures offers top-class whitewater rafting, paintball, biking, and kayaking. For over 30 years, the outfitter has provided quality rafting trips that allow its guests to experience the best that the Lehigh River has to offer. Mild or wild, you'll find a rafting adventure that fits your needs. The friendly and knowledgeable staff will ensure that you experience the safest and most action-packed adventure possible. Check the website for a long list of hotels, motels, inns, bed & breakfasts, campgrounds, and resorts in the area. A Fun-Filled Ski Adventure in the Poconos! Are you searching far and wide for outdoor adventure getaways in PA, where you'll get to enjoy the best in winter sports? Take a trip to the Poconos' favorite ski resort! 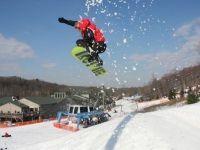 Shawnee Mountain Ski Area offers skiing, snow-tubing, snowboarding, and other cool activities. The Shawnee Mountain Ski Shop is your one-stop shop for everything you'll need on the slopes. Grab a meal at one of five delicious eateries. For family vacations and adventure getaways for couples in PA, Shawnee Mountain offers a variety of ski/stay packages, in which you'll receive the best accommodations in the Poconos during your fun-filled ski trip! A Great Place for Adventure Getaways in Pennsylvania! An enchanting Pocono resort located in the pristine mountains of Northeastern PA, Mountain Springs Lake is your one-stop destination for outdoor adventures. The extensive list of activities in the area includes tennis, fishing, golfing, hiking, horseback riding, whitewater rafting, biking, boating, canoeing, kayaking, and ATV riding. Enjoy cozy lodging at one of 37 spacious mountain resort cottages. Each cottage is equipped with a kitchen and outdoor charcoal grill, but if you choose not to do your own cooking, there are plenty of superb dining establishments in the area. A Beautiful Adventure Getaway with 100 Acres of Skiing! 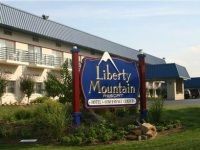 Situated on nearly 450 stunning acres, Liberty Mountain Resort provides its valued guests with 100 acres of skiing, snowboarding, and 14 lanes of snow-tubing. The 18-hole championship golf course is renowned in the region. For hikers and other outdoor adventurers, you'll be close to the Appalachian Trail and Catoctin Mountain State Park. All slopeside guestrooms feature an array of cool amenities and the luxury suite contains a living area, kitchenette, and whirlpool tub. A hot breakfast is included in your stay and you can enjoy dinner at one of two magnificent restaurants in the area.